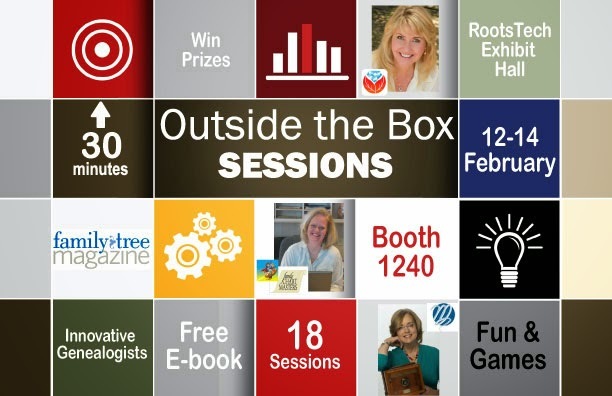 Rootstech is around the corner and that can only mean one thing for the vendor hall: Outside the Box. That's right, Alison Dolan from Family Tree Magazine, Maureen Taylor, the Photo Detective, Lisa Louise Cooke from Genealogy Gems, and I are together again for the Exhibit Hall at Rootstech. And if you've been around us at past conferences, you know it's a party. We've got it all happening in our corner, and we hope you'll come see us. We have free Outside the Box Sessions, games, prizes, and consultations running each day. The Exhibit Hall opens at 10:00 a.m. on Thursday and we're hitting the ground running. Stop by first thing, at 10:30, for our first game and a chance to win prizes. I'll be hosting a Genealogy Game Show and Pedigree Challenge. 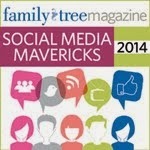 It's a hoot and a great way to start your time at Rootstech. And, did I mention, PRIZES! 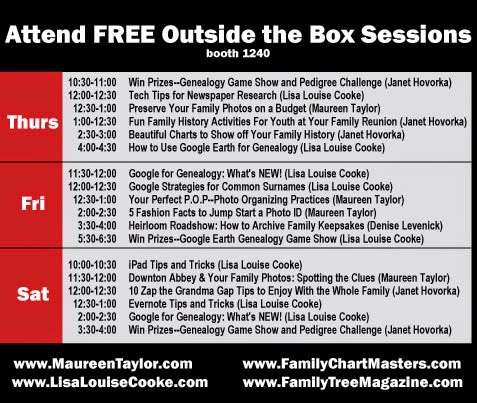 We'll be playing games throughout the entire conference though at our Family ChartMasters booth, so be sure to pop by often. I'll also be ending the conference on Saturday with the game show and prizes too. You won't want to miss it. Maureen, Lisa, Allison and I all have our areas of expertise and we've designed our personal Outside the Box Sessions around each of those. You'll be able to get some fabulous help for your genealogical problems right there in the Exhibit Hall. 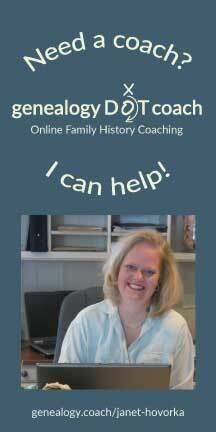 In fact, Maureen is available for you to schedule consultations for help with your family history photos. If you have an unidentified ancestor in a photo, bring it to her and she'll be able to help you track that person down. You can schedule a time to meet with her here. We've always enjoyed teaming up and providing these free Outside the Box sessions at various conferences. We love seeing old friends and making new ones and we hope you will come by often during your time at Rootstech. And before you come, don't forget to download your free Salt Lake City Travel Guide from Family ChartMasters. We've got you covered for a great Rootstech experience and we can't wait to see you.